This occupancy sensor from Enerlites is ideal for use in commercial settings to reduce the energy load consumed through lighting. Passive Infrared (PIR) sensors detect occupancy by sensing the difference between heat emitted from the human body in motion and the background space. In order to provide adequate coverage within a space, the sensors utilize a unique Fresnel lens which divides the coverage area into zones, thus enhancing the detection of small movement. Once an individual enters a space being monitored, the sensor responds to a change in the infrared background by turning the lights ON automatically. Once the individual leaves the area and the space is unoccupied for a selected period of time, the lights are turned Off automatically. 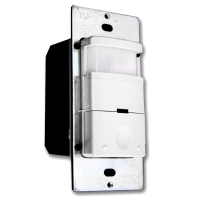 Incandescent: 800-Watt at 120-Volt Fluorescent: 800-Volt Amp at 120-Volt, 1600-Volt Amp at 277-Volt AC - Motor: 1/4HP at 120-Volt Coverage: 180 Degree, 1200 Square Feet Standard decorator wall plate included. Zero crossing function. Compatible with all electronic ballast. Adjustable sensitivity settings.